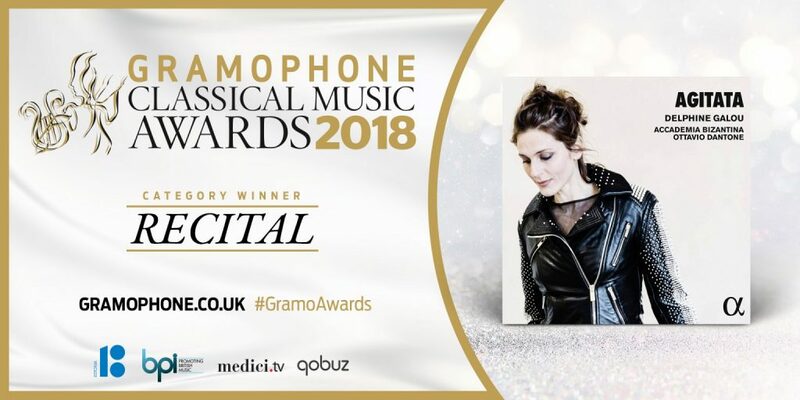 We are truly honored and extremely happy to report that Delphine Galou and Accademia Bizantina’s recording Agitata has been awarded the 2018 Gramophone Classical Music Award in the Recital category. Agitata, released in September 2017 on Alpha Classics, was shortlisted with a selection of excellent albums, whose reviews by the well-known British magazine you can read here; the winners were announced on Friday, August 31st. We would like to thank each and every person who worked on the recording and production of Agitata, the theaters and festivals that believed in the program and helped us bring Agitata on stage, and of course all the fans, friends and casual listeners that saw Accademia Bizantina, Ottavio Dantone and Delphine Galou perform Agitata in theaters, bought the CD or streamed the album online. I want to thank you for the rich and strong harpsichord chords and performance, of the D56 Tartini. All the others prefered either organ or a smooth cembalo. Your performance is the strongest. The baroque music must get a strong and metallic hit on the harpsichord. I am myself a violin player, I play on the streets, Timisoara and Edinburgh.